North Lake Tahoe visitors and residents alike are constantly on the hunt for those picture-perfect panoramic views of the lake that often land our mountain paradise in the BuzzFeed and Outside Magazines lists of vacation-worthy spots. Now that summer is blanketing the shores, it’s time to kickback and soak up some rays at one of the countless patios, decks or pools in North Lake Tahoe. Here’s a break down the elite group of pools, patios, and decks that are sure to leave anyone with a functional pair of eyes breathless. From mountainside to lakeside and up to the 8,000’ Summit, there are plenty of opportunities to lounge poolside. The High Camp Pool and Hot Tub rest at a whopping 8,200 feet at the top of Squaw Valley Resort’s Aerial Tram. Easily one of the most breathtaking options in the world to take a dip, its elevation treats guests to amazing views of Lake Tahoe and the surrounding Sierra Nevada Mountain range. 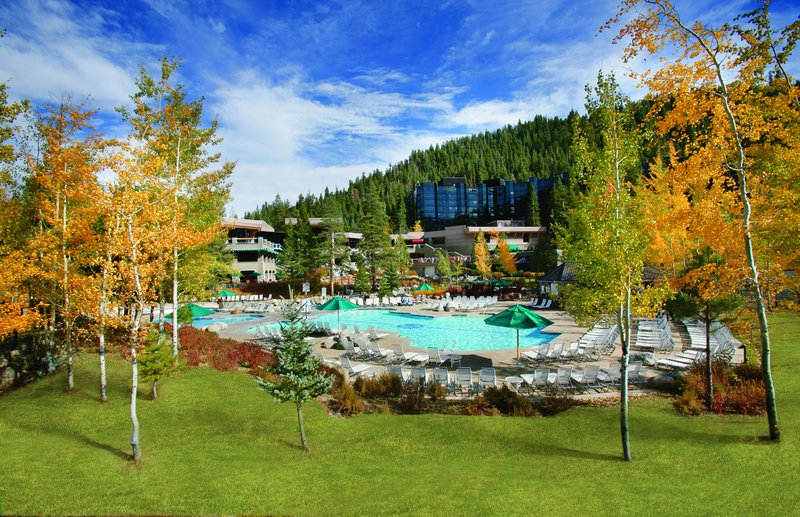 The Hyatt Lake Tahoe Resort, Spa and Casino boasts a lagoon-style swimming pool and two oversized jet spas and a wading pool. For those with more exotic taste! The Ritz-Carlton Lake Tahoe features two outdoor pools for lap swimming or relaxing mountainside that overlook the peaks of the ski resort. They have direct access to the brand new outdoor Backyard Bar & BBQ. The Resort at Squaw Creek features a large recreation pool, plunge pool, 120-foot waterslide, children’s pool, and three outdoor all-season whirlpools. All pools offer a sprawling view of Olympic Valley. Open patios are staples in North Lake Tahoe. No trip is complete without spending some time atop one of the staple outdoor offerings of our area. The Mellow Fellow Gastropub in Crystal Bay is constantly rotating its selection of 40 draught craft beers to sip on while playing one of their outdoor patio party games. Jason’s Beachside Grille in King’s Beach embodies the mountain feeling of the lake. Jason’s features the best salad bar around and hosts live entertainment throughout July and August. Sunnyside Restaurant & Lodge is steeped in North Lake Tahoe history and is home to the largest deck on Lake Tahoe, and is accessible by boat, foot or car. Homewood’s West Shore Café deck is host to numerous activities from fine dining at night to scheduled yoga classes by day, as well as fire pits for s’more making. Sitting only 100 feet above the shoreline, Christy Hill Lakeside Bistro in Tahoe City is a romantic restaurant with spectacular lake views. Garwoods Grill & Pier is a hub of activity in Carnelian Bay during summer and one of few places with a boat valet service. Definitely order a famous Wet Woody. Plumpjack located in Olympic Village offers an upper patio deck perfect for catching a view of the beautiful Sierra Nevada mountain range. Spindleshanks American Bistro & Wine Bar represents the best of both old and new Tahoe, with views of both the pine-lined golf course and gorgeous lake. Big Water Grille sits just below Diamond Peak Ski Resort and is known for spectacular panoramic lake views that are among the best around.